restauriertes Tatra 52 Langchassis Landaulet. Probe gefahren werden. Anfragen gern via Telefon oder E-Mail. In typical African manner throughout the festive launch of the book “Tatra starring” writing duo Milan Olšanský – Radomir Smolka, which took place on Wednesday 24 2. In the areas Marrakesh Café Lounge. The godfather of the book became Martin Kolomý and baptized with sand coming directly from Dakar. 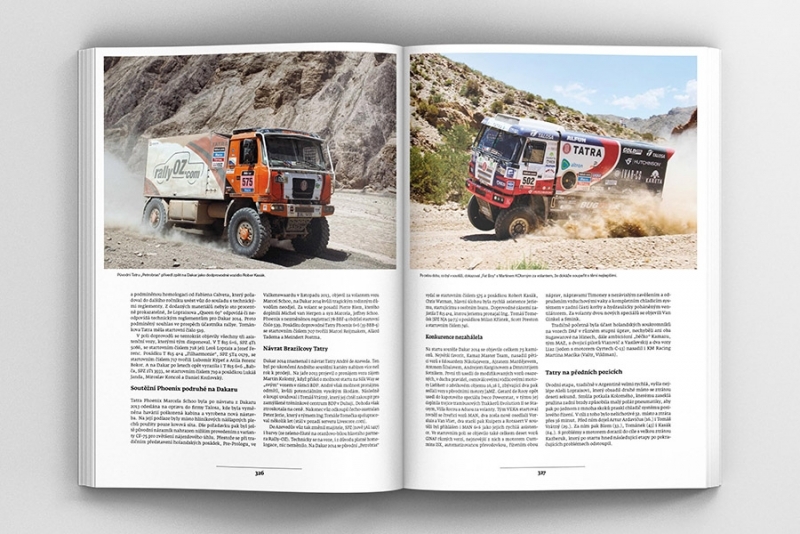 TATRA TRUCKS SpA publishes this exclusive publication on the occasion of the thirtieth anniversary of the first launch of TATRA vehicles on the Dakar Rally. The publication “starring Tatra” with the subtitle “30 years of the toughest competitions in the world” follows the evolutionary line competition, accompanying, and of organizing customer TATRA vehicles that occupied by the various competitions and races around the world. 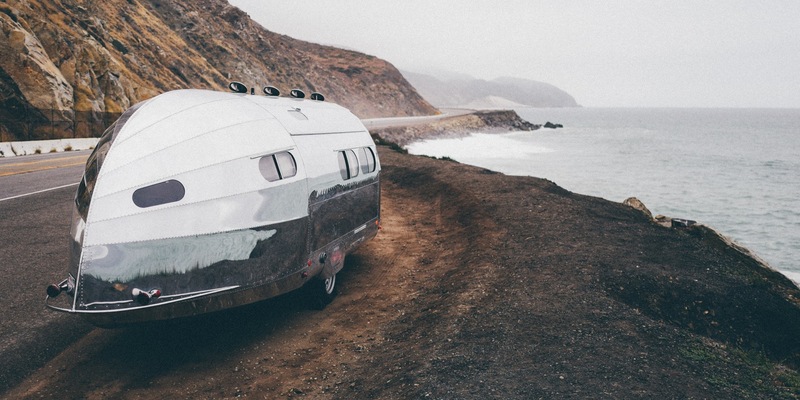 The main motive of the product – TATRA truck, which literally shows the way for many others, even where seemingly there is none. The unique concept of heavy goods vehicle with a unique chassis with a central tube and independently suspended half-axles and suspension ensures mobility even in the most difficult terrain in the world. Contests and races were for the Tatra, the engineers and workers, always “field laboratory” where they could verify the meaning and viability of their solutions. Literally accelerated endurance and performance tests in a direct comparison with the competition contact exercise led to significant findings in serial production. The application of innovations of higher order or even to confirm the correctness of policy adjustments. The result was and are heavy trucks TATRA fulfilling customer demands for durability, longevity, reliability and economical operation. Thirty years ago, TATRA entered into competition with cars then brand new business class T 815. Over the years and decades to develop and modify the models and their basic assemblies and components. Customers and competitors showed that the cars very close to those of normal production and even the cars in the standard version can effectively fight and win over once built specifically. Today, after three decades, he takes the baton in the toughest competitions of the world representative of the latest Business Council – TATRA Phoenixx. The book “starring Tatra” is divided into more than thirty chapters accompanying the reader not only each year of the competition, but also the uniqueness of the design by the Tatra brand contributes to the treasury of the global automotive industry. Combination of information very rich text with hundreds of photos and dozens of original technical drawings is the basis of high value-added paper, which is closer in concept “non-fiction”. The eye and mind of the reader will be pleased that a number of information and photos are published here for the first time. Concept books working with the Communication story in several graphics processing levels. Each chapter in the book is given over large photographs both sides (A3), followed by photo documentation of the vast majority of the participating vehicles. Pictures themselves provide the original file, which in this complex was never published. Their careful examination together with “consumption” labels given readers a basic picture of the topic. The second level is its own chapter titles that characterize every year competing with TATRA vehicles. Their imaginary arrangement is another way to read the full story accelerated. Somewhat more detailed insight into the problems discussed then brings so. “Intertitles” or a few words the characteristics of the sections – this is the third story. Of course the best way to plunge into the book is to read the entire text, which provides details in the form of “cream-skimming”, such as the engine serial number, license plate of each vehicle, the fate of competition specials, during the various competitions and more. A separate story are technical drawings of individual vehicles and solving some of their assemblies. The complexity of the book is enhanced by highly detailed statistics on the participation of the crew of each vehicle in competitions and races. There are two comprehensive tables. The first is devoted to the participation of the crew of Tatra vehicles at the Dakar Rally and other participation in all other competitions. Book reader will find answers to many questions, from which have often become myths. Reveals not only the development of competition specials and inspects the “constructor kitchen TATRA” but They also learn about the circumstances of nicknames, such as “Zero Car”, “Trainer Dakar,” “Grandma,” “Fire truck”, “Puma”, livescore, “” Petrobras “,” Frog, “” Princess, “” Scuttle “,” Philharmonic “,” Máňa, “” Fat Boy “or” Phoenix “. Author couple Olšanský Milan and Radomir Smolka is a guarantee of the complexity of the information submitted. Long-term practice of publishing an independent specialist in marketing automotive industry on one hand and high professional erudition award-winning automotive designer and developer not only competition specials TATRA last fifteen years, as well as several new model series heavy duty vehicles TATRA on the other hand, has created a unique book. Ing. Radomir Smolka, member of TATRA TRUCKS SpA and Chief Technical Officer, a three-time Dakar participant in long-distance competitions. His presentation skills and other publications are an important part of creating a good brand reputation Tatras. 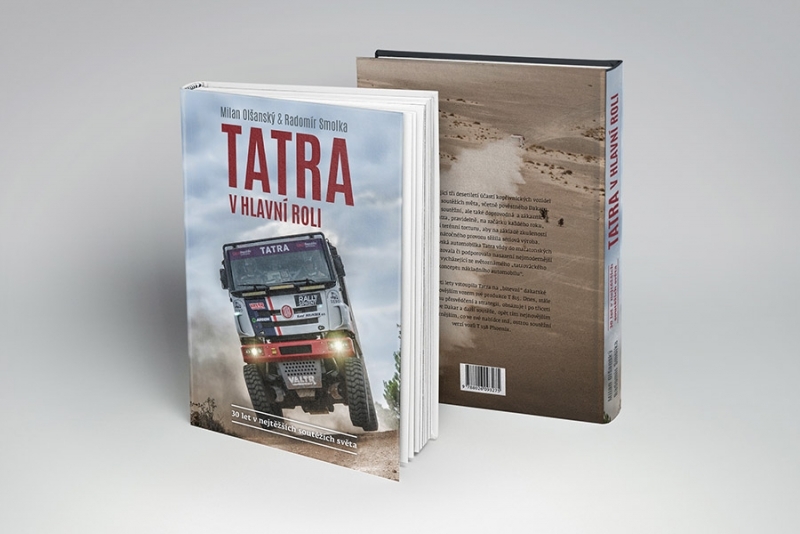 The book “starring Tatra” is about A4 size, has more than 400 pages, weighs 2.5 kg and anyone interested can buy it at T-Shop TATRA TRUCKS for 1090 CZK. T 57b for sale in Northern Germany. Restored from 2011 to 2013. Price : 13500 Euro. Please contact osm.kruempelbeck@t-online.de for more details. 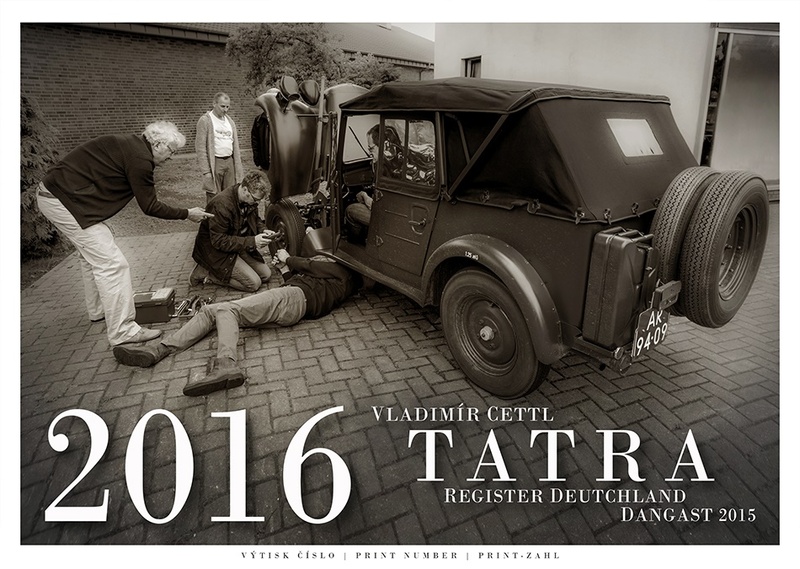 For his 2016 calendar, Czech photographer Vladimir Cettl chose the 2015 TRD meeting to shoot pix of Tatra lovers, their cars and the commitment to their hobby. Rare T 57K for sale. Car needs finishing. Body restored with partly new wood. 1.7 litre flat twin. Original T 57K wheels. Engine did run in 2012 and looks OK. Complete with many parts, ready to fit. Front seats original + replica rear seat fram present. 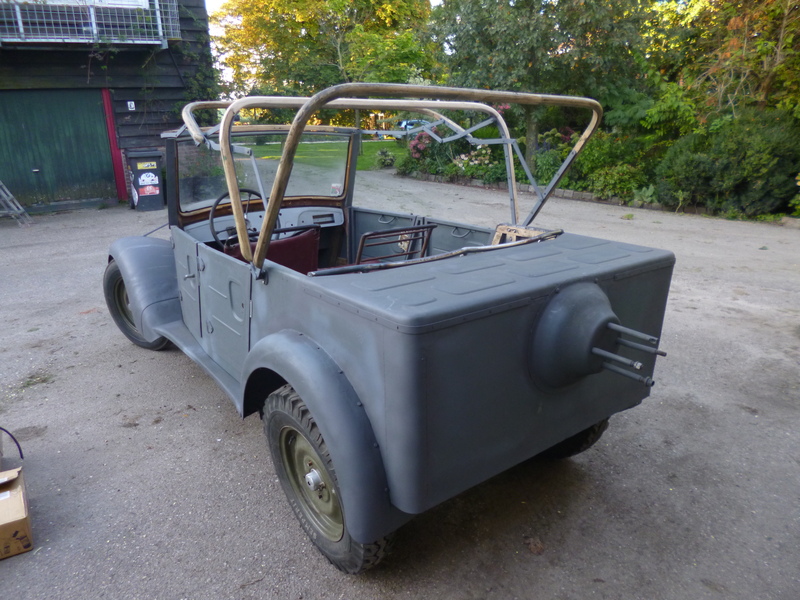 Soft top has to be manufactured; soft-top frame is present. EC papers, no registration. This 1966 Tatra 2-603 (chassis T603H79361507573) is a former museum car that looks to be in fantastic condition. 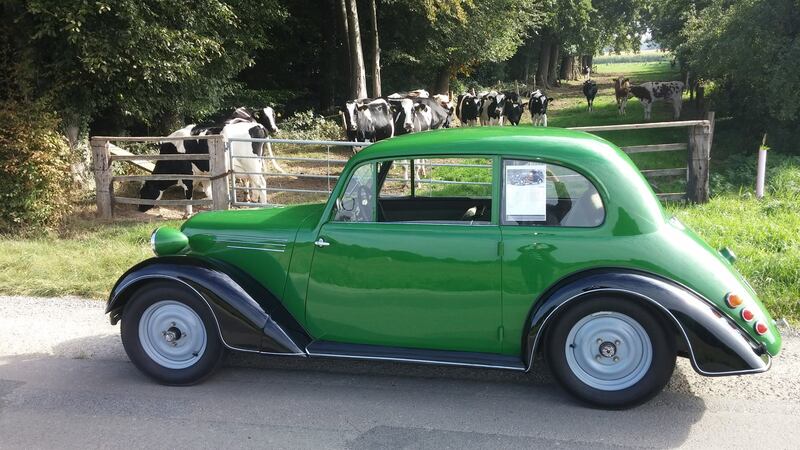 Said to be in exceptional running and driving condition as well, it’s easily one of the nicest streamlined Tatras we’ve ever featured and counts both an unusual but attractive color combo as well as a rare nose configuration in its favor. Find it here on eBay in Saint Ann, Missouri with a $36,900 BIN. Special thanks to BaT reader Kyle K. for this submission. Looking fot the T 77a my great-grandfather lost 78 years ago. 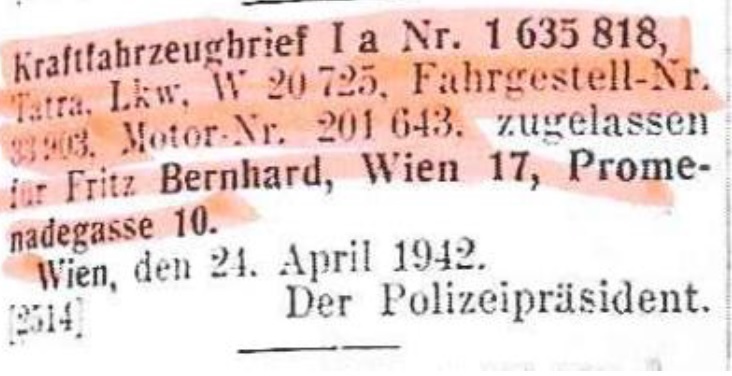 Jérôme Segal’s great-grandfather lost his T 77a in 1938, in Vienna when he had to flee Austria. His great grandson now is curious whether the T 77a still exists and did a lot of research.